We are finally getting into the routine of things with our new life on the West Coast. We're absolutely loving our new neighborhood, Old Pasadena. Right in our backyard, there's Memorial Park with a nice playground (where we spend most of our afternoons) and Levitt Pavilion, an amphitheater (we've been to a couple of concerts there already). On Sundays, there's a farmer's market literally steps away from our front door. There are a ton of restaurants and shops just down the street; all I have to do is put the little guy in the stroller and we're ready to go. I've even started running again. The Rose Bowl is the perfect place for a quick jog. After a long, painful process of searching for childcare, we finally enrolled Austin twice a week at a daycare in San Gabriel. He's loving it so far. And I'm loving the extra time to run errands, clean house, and cook up a decent meal. 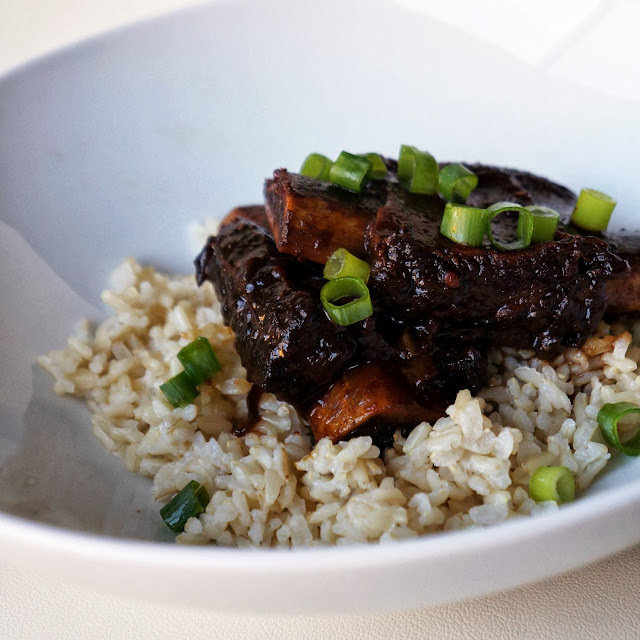 The first day Austin was at daycare, I made these delicious melt-in-your-mouth short ribs. over medium heat with a dutch oven, sear the short ribs until browned on all sides. add in rice wine to deglaze the pan. add in cinnamon, star anise, ginger, garlic, cloves, brown sugar, soy sauce, applesauce, onion, and tomatoes. then add in water until the short ribs are just submerged. braise over low-medium heat for 2 to 3 hours. season with salt and pepper to taste.